The estate tax rate is currently 40%, and it’s scheduled to remain at that level. The estate tax exemption increased to $5.43 million for 2015 (see Chart 5), and it will continue to be adjusted annually for inflation. To avoid unintended consequences, review your estate plan in light of the changing exemption. A review will allow you to make the most of available exemptions and ensure your assets will be distributed according to your wishes. The gift tax continues to follow the estate tax exemption and rates. (See Chart 5.) Any gift tax exemption used during life reduces the estate tax exemption available at death. Using up some of your exemption during life can be tax-smart, depending on your situation and goals. See Case Study V on page 28. Warning: You need to use your 2015 exclusion by Dec. 31. The exclusion doesn’t carry over from year to year. For example, if you don’t make an annual exclusion gift to your granddaughter this year, you can’t add $14,000 to your 2016 exclusion to make a $28,000 tax-free gift to her next year. The GST tax exemption can be a valuable tax-saving tool for taxpayers with large estates whose children also have — or may eventually have — large estates. With proper planning, they can use the exemption to make transfers to grandchildren and avoid any tax at their children’s generation. A federal estate tax deduction is available for state estate taxes paid. Keep in mind that some states impose estate tax at a lower threshold than the federal government does. To avoid unexpected tax liability or other unintended consequences, it’s critical to consider state law. Consult a tax advisor with expertise on your particular state. If one spouse dies and part (or all) of his or her estate tax exemption is unused at his or her death, the estate can elect to permit the surviving spouse to use the deceased spouse’s remaining estate tax exemption. Warning: Portability is available only for the most recently deceased spouse. It doesn’t apply to the GST tax exemption and isn’t recognized by some states. And it must be elected on an estate tax return for the deceased spouse — even if no tax is due. The portability election will provide flexibility if proper planning hasn’t been done before the first spouse’s death. But portability doesn’t protect future growth on assets from estate tax like applying the exemption to a credit shelter trust does. Trusts offer other benefits as well, such as creditor protection, remarriage protection, GST tax planning and state estate tax benefits. So married couples should still consider marital and credit shelter trusts — and transferring assets to each other to the extent necessary to fully fund them at the first death. Transfers to a spouse (during life or at death) are tax-free under the marital deduction, assuming he or she is a U.S. citizen. To minimize estate tax, gift property with the greatest future appreciation potential. To minimize your beneficiary’s income tax, gift property that hasn’t already appreciated significantly since you’ve owned it. To minimize your own income tax, don’t gift property that’s declined in value. Instead, consider selling the property so you can take the tax loss and then gifting the sale proceeds. Plan gifts to grandchildren carefully. Annual exclusion gifts are generally exempt from the GST tax, so they also help you preserve your GST tax exemption for other transfers. 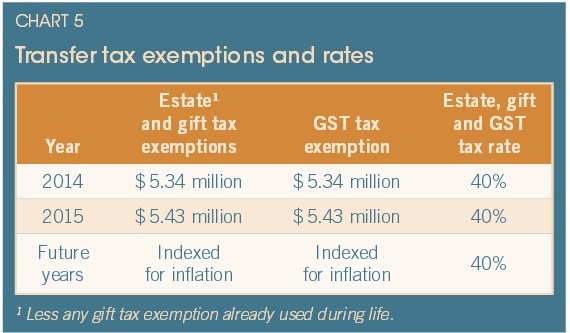 For gifts to a grandchild that don’t qualify for the exclusion to be tax-free, you generally must apply both your GST tax exemption and your gift tax exemption. Maureen has an estate of $8 million. In 2015, she has already made $14,000 annual exclusion gifts to each of her chosen beneficiaries. She’s pleased that the $5.43 million gift and estate tax exemption will continue to be indexed for inflation. But she believes her estate will grow at a much faster rate and is concerned that she could have substantial estate tax exposure. So she gives away an additional $3 million of assets. Maureen uses $3 million of her gift tax exemption by making the taxable gift. Therefore, her estate can’t use that amount as an exemption. But by making the taxable gift, she also removes the future appreciation from her estate. If the assets, say, double in value before Maureen’s death, the gift will essentially have removed $6 million from her estate. This amount escapes the estate tax. One caveat: Watch out for taxable gifts made within three years of the date of death, because they may have to be brought back into the estate as though they had never been made. Gift interests in your business. If you own a business, you can leverage your gift tax exclusions and exemption by gifting ownership interests, which may be eligible for valuation discounts. So, for example, if the discounts total 30%, in 2015 you can gift an ownership interest equal to as much as $20,000 tax-free because the discounted value doesn’t exceed the $14,000 annual exclusion. Warning: The IRS may challenge the calculation; a professional, independent valuation is recommended. Gift FLP interests. Another way to potentially benefit from valuation discounts is to set up a family limited partnership. You fund the FLP and then gift limited partnership interests.Warning: The IRS scrutinizes FLPs, so be sure to properly set up and operate yours. Pay tuition and medical expenses. You may pay these expenses without the payment being treated as a taxable gift to the student or patient, as long as the payment is made directly to the provider. A credit shelter (or bypass) trust helps married couples minimize estate tax and provides additional benefits. A qualified terminable interest property (QTIP) trust can benefit first a surviving spouse and then children from a prior marriage. A qualified personal residence trust (QPRT) allows you to give your home to your children today — removing it from your taxable estate at a reduced tax cost (provided you survive the trust’s term) — while you retain the right to live in it for a certain period. A grantor-retained annuity trust (GRAT) works on the same principle as a QPRT but allows you to transfer other assets; you receive payments from the trust for a certain period. Finally, a GST — or “dynasty” — trust can help you leverage both your gift and GST tax exemptions, and it can be an excellent way to potentially lock in the currently high exemptions while removing future appreciation from your estate. Along with protecting your family’s financial future, life insurance can be used to pay estate taxes, equalize assets passing to children who aren’t involved in a family business, or pass leveraged funds to heirs free of estate tax. Proceeds are generally income-tax-free to the beneficiary. And with proper planning, you can ensure proceeds are excluded from your taxable estate.